MANILA, Philippines – The long wait is finally over. All the propagandas, advertisements, miting de avance promises, even the bashings and online altercations of all the netizens will be put to rest today as the National Elections kicked-off this Monday morning, May 9, 2016. The COMELEC along with PNP and AFP assured that they are all on standby to ensure a peaceful elections all over the country. But, few hours before the commencement of the historical event in Rosario Cavite, 7 supporters of Mayor Jose Ricafrente were all shot dead. Cavite PNP found 1 bullet hole in a black SUV where they claimed to be the victims’ vehicle. Sadly, the bodies were all laid flat facing the ground and have gun shots in the head which means that the victims were summarily executed. Cavite Police has yet to declare this shooting incident as an election-related violence. But Mayor Ricafrente is firm in his stand that this killing is politacally motivated. In Sultan Kudarat, Maguindanao province, a grenade blasted in front of a polling precint where one civilian died followed by a break-in and stealing of VCMs (Vote Counting Machines) by 20 plus armed and un-identified men. The authority is still tracking down the culprits while the registered voters in that community still wait for the replacements VCMs and go-signal from the COMELEC to resume the election. Aside from the violent incidents in this election-hot-spot province, some minors aged 14-16 were caught casting their votes. The BEIs defended that the minors’ names are in the voters list and a valid reason for them to hand ballots to the group of youth. 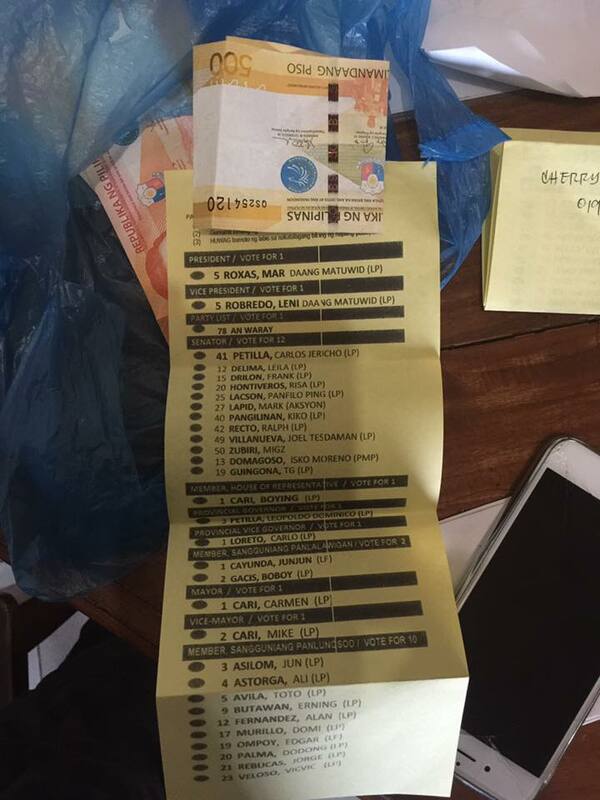 Meanwhile in Leyte, Police officers were forced to apprehend a man who allegedly buying votes in exchange for cash. 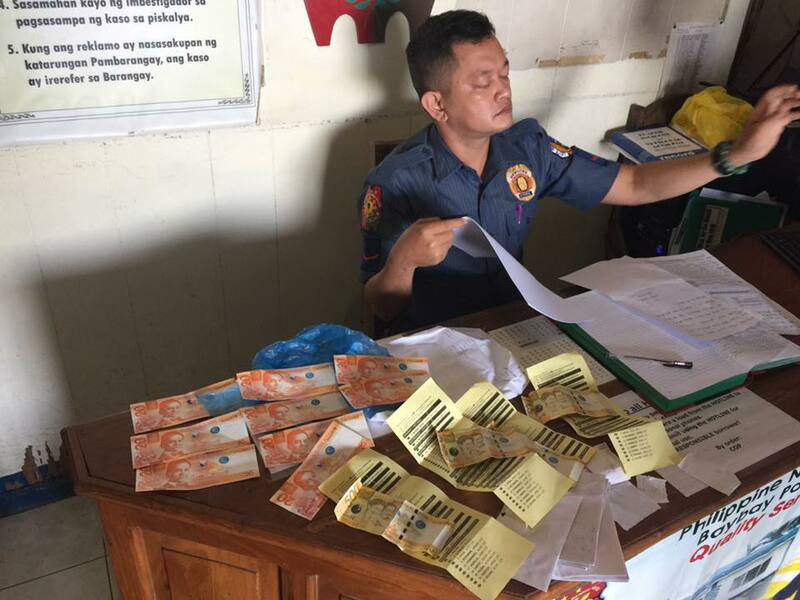 The policemen also confiscated sample ballots with Liberal Party candidates printed on them and some cash that will serve as legitimate evidences against the suspect. Just like the previous elections, non-working and malfunctioning VCMs are still the most common issues that frustrate some voters. In the precints of Sen. Chiz Escudero and Miriam Defensor-Santiago for example, the machines were rejecting the ballots that caught the attention of the Vice-presidential aspirant. Sorsogon, Masbate, Saranggani Province, Zamboanga, Quezon City, Pasig and San Juan are just some of the key areas in the country that experienced VCM failure. But the COMELEC has standby technicians and back-up VCMs as their contengencies to assure the people of a succesful election. Text messages were circulating which states that there are 20 Million pre-programmed ballots were intentionally distributed in various precints nationwide which allegedly favors administration-standard-bearer Mar Roxas. COMELEC Chairman Andres Bautista and Spokesman James Jimenez frankly denied the issue and boldly addressed the media that the pink-lined-pre-programmed ballots are non-existent. PPCRV also backed-up Bautista and Jimenz’s statement. COMELEC bosses warned the public that sharing of text messages that mislead the people with ill-informations is a serious election crime. Speaking of election crimes, taking actual photos of the shaded ballots and taking selfies with them are also considered as an election offense and punishable by law with up to 6 years of imprisonment if tried and proven guilty. 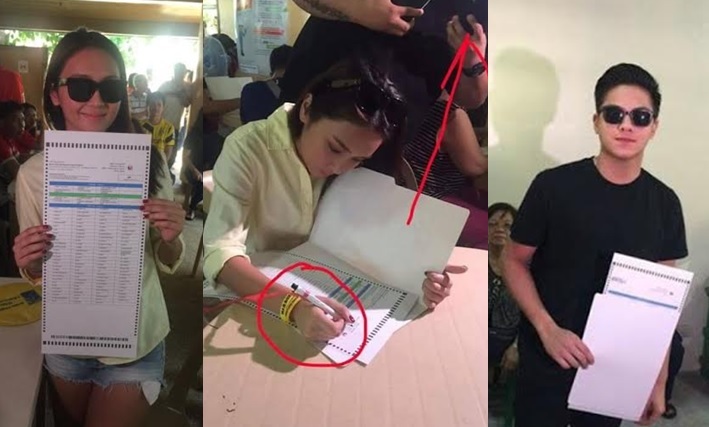 In line with this issue, teleserye and rumored teen lovers Daniel Padilla and Kathryn Bernardo are now being criticized by netizens for posting photos online while holding their ballots inside the polling precincts. 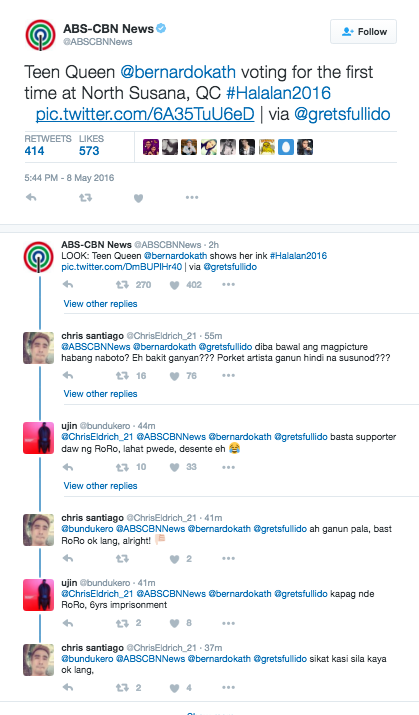 The controversial photo of Kathryn was traced from ABS-CBN’s twitter account via Gretchen Fullido. Minutes after it went viral and gained different negtive reactions from the netizens, the post was removed. Aside from the malfunctioning and non-working VCMs, voting precints located on upper floors became burdens for the senior citizens and PWDs. Obviously struggling to get into their respective precints due to their physical situations, majority of the elederly and disabled voters had decided to leave and go home instead. Missing names in the precints is also a major problem for many voters. Many people who arrived in the voting venue and endured the long queu lines as early as 5am ended up disappointed because they were not allowed to vote as their names are not displayed in their appointed precints. COMMELEC Spokesman James Jimenez gave an explanation on this matter. According to Jimenez, there are just two reasons why the voters name are not displayed in the precints; either the person failed to do the biometrics or has registered twice so the system automatically removed the name under the said cirmustances. 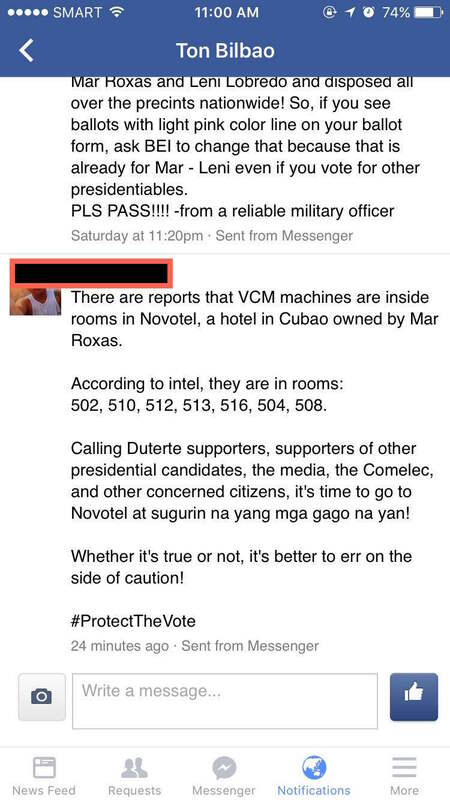 COMELEC was alarmed when a Facebook post from various concerned netizen went viral stating that there are some VCMs which are being kept by LP Bet Mar Roxas inside Novotel Hotel in Cubao, Quezon City. Chairman Bautista wasted no time and immediately hurried to Novotel along with the media folks to investigate the allegations. Bautista failed to see the actual VCMs but confirmed that there are serveral Smartmatic Technicians who are currently checked-in the hotel. He also explained that the National Technical Headquarters of Smartmatic is just a walking distance from Novotel. Past mid-day, PPCRV confirmed that there was another blast happened in Masbate where one candidate died. Masbate has been declared as one of the election hot spots in the country. 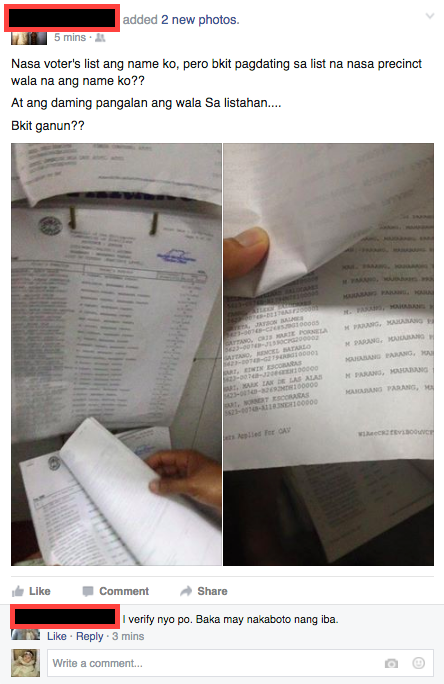 5 more hours before the election closes and COMELEC and PPCRV disclose that they are still receiving election-related complaints. 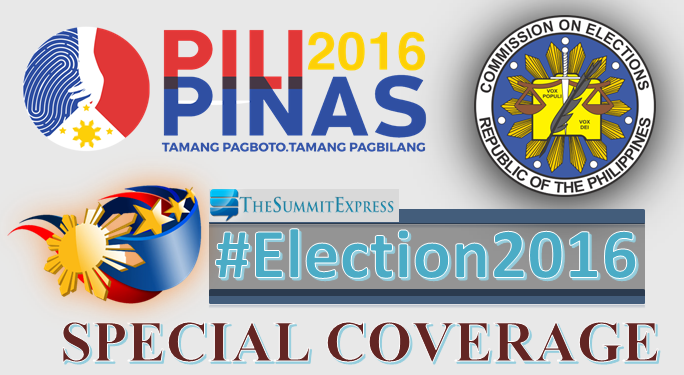 The Summit Express will be on stand by to bring you the latest updates in 2016 National Elections.